"A decision taken in haste and without consultation." 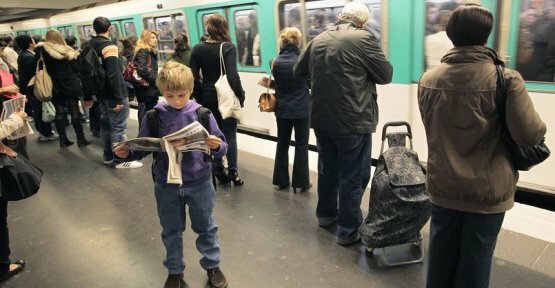 In the entourage of Valérie Pécresse, president LR area and of the Île-de-France Mobility, which manages all transportation in the île de france, the announcement of the mayor socialist of Paris, Anne Hidalgo, who wants to make free public transport for the small parisian aged four to eleven years of age, is received with great caution. "Free it pays," says one. Île-de-France mobility, which manages the entire transport ile-de-france with the contributions of local communities, including Paris, is "not a drawer". "Anne Hidalgo will have to compensate this measure to the last euro". The entourage of Valérie Pécresse has made the calculation: "150.000 children parisians concerned multiplied by 341 euros the cost of the package imagin R, this gives 51 million euros a year." In an interview published Wednesday in Liberation, the mayor of Paris has announced that it has decided to follow the recommendations of a report entitled "For a big-bang of the pricing for transport in the Greater Paris", which stands to forgo to make a totally free public transport, but proposes 23 measures of lesser magnitude. according To the mayor of Paris, the project would cost much less to the city. The first four measures that will be implemented on the 1st September would decline as well: the $ 2.6 million for a Navigo Pass for free for the Parisians with disabilities under the age of 20 years, $ 7.1 million for the reimbursement of 50 % of the subscription of the middle and high schools, 200,000 for the support of the subscription to Vélib for the 14-18 years old, and $ 5 million for the free Pass for the Parisians of four to eleven years. The total would be 5 million in 2019 and $ 15 million in a full year. To ensure the funding, the Town hall is considering a redeployment of its budgets, and in 2020 an assignment of a portion of the proceeds of the new market of urban furniture information, that is to say, billboards. The transport is a competence before any regional. It is therefore the region that has the responsibility for the management of transport, sets tariffs, manages the operating budget, the funding and operation of the network, through the agency of Ile-de-France mobility (IDFM). In this field, Paris, in that as a department, has nevertheless the right to help its citizens to travel for less, explains it in IDFM. In the department of Val-de-Marne, for example, from January 2018 all retirees, both taxable and non-taxable, benefit from a fare card at half price. This measure was decided by the Île-de-France Mobility and the county Council, after two years of negotiations, reminds the department of the 94 on its internet site. It is the lack of consultation that stuck to the side of the region. "I do not question the merits of the idea of making free transport for young people. This is not necessarily a silly idea, recognizes Stéphane Beaudet, head of transport in Île-de-France Mobility. But it is necessary to work together. Paris cannot work alone," he says, recalling that the region Île-de-France strives to "organize transport fair", as the gel for the past two years, the price of the Navigo pass and Imagine R.
according To him, "technically, the measure is not feasible." "Going to explain to a controller in that it will control a child under the age of 11 years old who has not even the obligation to have his identity card on him...! And how to verify that it lives well in Paris and not in Issy-les-Moulineaux?" tance Stéphane Beaudet. And to add that the creation of a new ticket "takes technically one year", while the mayor of Paris wants an implementation for September 2019.
beyond The differences, the person responsible for transport acknowledges, however, that the mayor of Paris, who wished to have a time entirely free of charge public transport in Paris, has been mourning. "Gratuitousness cannot be alone is the alpha and the omega of a policy of transport and mobility", held in effect Anne Hidalgo in Release. "At least on this point, one falls agreement: the totally free this is not the solution". And to quote the conclusions of the report Rapoport, sponsored by the Île-de-France Mobility, which was against free transport: "an idea obviously attractive," but that would reduce car traffic by only about 2%, which would have only a minimal effect on the quality of the air and would have the additional effect of saturating even more of transport 6 to 10 per cent, said the report, "which is obviously not the goal".